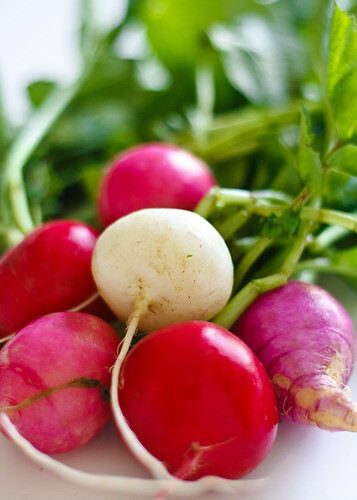 Easter egg radishes - crunchy, peppery and downright colourful. Who could resist that? I seldom cook these beauties. They end being mushy and smell awful. The only time I would do that is while making sambar. Otherwise, they are good to go with just a squirt of lemon juice and salt. The radish greens, with a mild radish-y flavour, taste equally good too. If you haven’t cooked the greens, you should definitely give a try. In addition to being nutritious and tasty, its economical. I have paid for those organic greens along with the roots. And I am going to use every bit of it. A good place to start, is to cook them with lentils. Also, Kalyn’s crustless quiche is a very good recipe for radish and beet greens. Otherwise, you can enjoy them in sandwiches like I did. Garlicky radish greens are piled along with sautéed sweet peppers and onions. 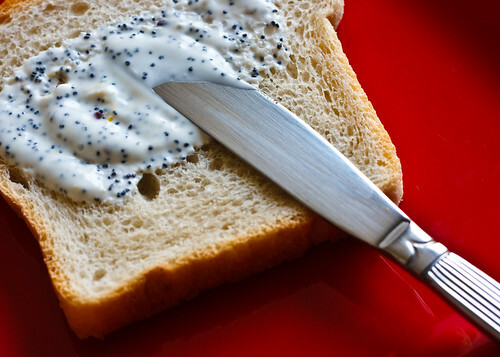 Complementing the vegetables is the creamy poppy seed spread. Those tiny little seeds add an interesting crunch making this a regular in my kitchen. On the whole, I think this sandwich will also be nice as a warm salad, served with toasts on the side. Whisk all of the above in a bowl into a smooth mixture. In a skillet, sauté bell peppers and onions separately with salt and pepper. Transfer to a plate. In the same skillet, stir fry radish greens with garlic and red pepper flakes, until wilted but green. Its always a good practice to wait till the last minute, while adding salt to any greens. They cook down so much, and may end up too salty. So, just before removing the radish greens from the skillet, add a pinch of salt, toss and transfer to the plate with peppers. 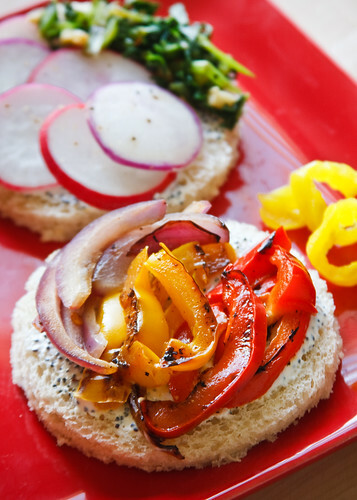 Toast bread, apply spread on both the slices, pile sautéed greens, peppers, onion and sliced radish, cover with the other slice, slightly press, cut and serve. First time hearing a radish sandwich! The spread looks wonderful...Th poppy seeds we get in india is white in color. Do u have several vareties of it there? Ooh, I love salad sammies! And I've been looking for a good poppy seed dressing recipe. Thanks! Whoever said that healthy does not always looks beautiful.... this sandwich must have been a delight to eat. I've never tasted poppy seed dressing. Looks yummy! These little things are always in my kitchen, but what a way to use them!! i make salad almost everyday.. but never thought of a sandwich. :) right about cooking them... in my home they almost never make it to the stove. Sandwich looks refreshing and lovely. I have to try tofutti, will check for this in my store. what a lovely sandwich Suganya. I am hungry now Can I have that plate? Simple and utterly delicious. That poppy seed dressing is to die for, Suganya. Thanks for the vegan option. Sug, u will convert radish haters like me into it's slave with those gorgeous pics and recipe :) i am hooked! I do agree that they smell awful. I have made only sambar with them. Would try this sandwich. oh yum! i love radishes. Gorgeous Sandwich..Unique,Nice and healthy one too..
i love radishes..but not too fond of poppy seeds...the sandwich does look ravishing! Don't you just love those Easter egg radishes? They're so happy! Oh I mae this poppy seed dressing too. Add a little mustard too, to it :) lovely recipe, Suganya! While I like radish, the other two here don't so I don't buy this very often. The poppy seed spread, now that sounds very interesting. Never seen anything like this before. i'll pass on the radish, bu concur on the radish greens. i love the lemon-poppy seed dressing idea. Thank you for this. I'm surprised to see how many people have never heard of a radish sandwich. I've been eating them for 60 years. I'll try it with your dressing next time. Thanks again. Oh my gosh, I am absolutely in love with Poppy Seed dressing (store bought until now!) and I cannot WAIT to try your recipe - thanks for posting. Amazing pictures, by the way!